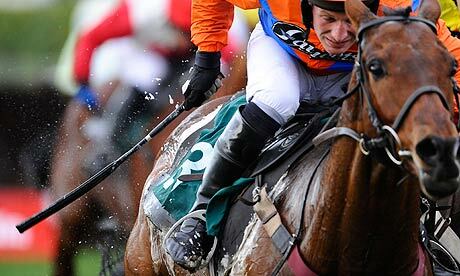 Above: Jockey beats living hell out of horse. As a native South Floridian, I find myself listening to Dan Le Batard’s radio show quite frequently. Yesterday, despite the fact that he was working on a non-visual medium, Le Batard kept alluding to some horse race he showed on his television show that I don’t ever watch. The horse (his name is Spicer Cub, btw) that ran twice as far as every other horse nearly won the race. I didn’t say the horse did not die from whipping he received from that little jockey. He very well might’ve, because the little man with the whip was going to TOWN. Check it out after the jump. Well worth it.